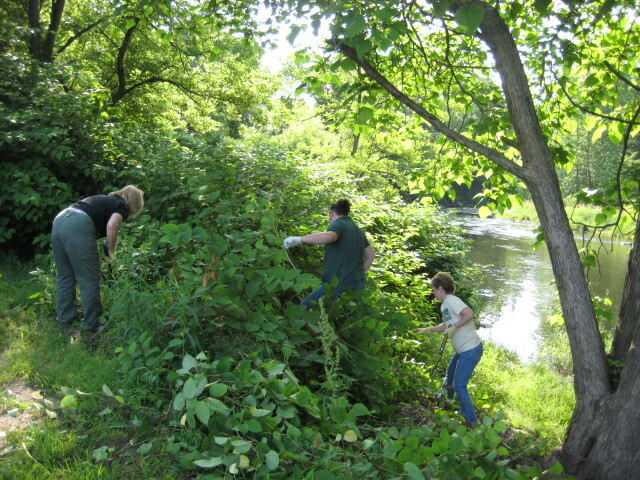 With their shallow root systems, infestations of noxious weeds, particularly knotweed, along local streams and rivers can lead to erosion and flooding, and crowd out native plants and animal habitat. One effort to address these problems is a multi-phase, multi-year project to show local residents how they can combat erosion and non-point source pollution on their riverbank property. Thus, on a recent morning volunteers from The Lackawaxen River Conservancy (TLRC) joined staff members of the Wayne County Conservation District (WCCD) for a work day to cut down a heavy infestation of Japanese knotweed and other invasive species at a demonstration site along the Lackawaxen River, at the Stourbridge Complex located on Route 6 in Honesdale. That effort prepared for a public information event on July 11th, when a member of the National Park Service explained to local residents the various steps and techniques they might employ to combat invasives on their properties; representatives of TLRC and WCCD were on hand to answer questions about the project. Following an application of herbicide by a licensed NPS specialist, in the fall the area will be covered with top soil and planted with a nurse crop of grasses to provide a stable foundation for the planting early next spring of native grasses, shrubs and trees that will hold the soil and prevent non-point source pollution. create a sign at the site to inform visitors of the project. Members of Boy Scout Troop # 1 have been recruited to create a sign at the site to inform visitors of the project.